Posted on March 8, 2016 by Karatzas Marine Advisors & Co. The vertical decline in the dry bulk market in the last year has been as unexpected and painful as it could have been. The decline has been as dramatic as to make news in the mainstream business press; unusually weak freight rates caught the attention of the international business press, and rightly so. The weak freight market has had repercussions in many aspects of shipping, from negative cash flows to the value of vessels. Asset prices for dry bulk vessels have been in free fall as a result of forced sales, complete dearth of debt financing, minimal expectations of any imminent market recovery, and the strong possibility of negative cash flows for several more months if not years. On average, dry bulk vessels’ values have dropped by 30-60% in the last twelve months, typically with modern tonnage holding better onto their value. As a corollary to the drop in vessel values, there have been a couple of conspicuous vessels arrests by two international shipping banks given that LTVs have dropped below as per the minimum value clause stipulation in the loan agreement. Please see graph adjacently with selected market data on recent market trends and vessels values. For shipowners and institutional investors who believed in a market recovery in 2013 and went ‘long’ the market, it has been a painful experience; most equity investments are underwater, metaphorically speaking, at least on an ‘un-realized’ basis. The timing had been clearly wrong, in retrospect. While some owners have decided to dispose of shipping assets and realize losses now before they get out of hand, most owners and investors are trying their best to play for time, in the hope of a timely recovery. Every new sale would lead to loss of equity and would mark a definite step-down in values; a process that affects both the shipowner – who now has to realize a loss, but also for all the other owners of similar tonnage, as they would have to mark to a lower mark the value of their fleets – something that would affect their balance sheet, and may trigger negative implications for the income statement as well. Vessels’ values had been a white-hot topic in the years following the original market collapse in 2008; asset prices dropped fast and ferociously and impacted in short order the collateral clauses and negative covenants in loan agreements, such as the loan-to-value clauses (LTV). Shipping loans were technically in default then, on massive scale, since prices were dropping below the typical 70-90% loan-to-value requirement. The financial world then, however, was under the threat of a systemic collapse and shipowners were holding strong cash reserves coming through the best days of shipping ever. In a generally value collapsing environment, then, but with generally positive cash flows still, shipping banks were accommodating enough to ‘gently’ ask the borrowers for additional equity and for amended loan agreements with loan-to-value covenants heavily de-clawed. There was a concentrated effort to avoid hard defaults and vessel arrests just because of asset prices were falling. In addition to a cavalier attitude to vessel values at that time, vessel valuation methodology was also amended – and instead of market comparable method (“last done” as it’s known) typically required by loan agreements, there were substitutions with the replacement cost method and the income / discounted cash-flows valuation approach. The sale & purchase market was distorted in many market sub-segments with relatively few data-points those days, a great amount of those sales being distressed sales, and there legitimate reasons to believe that the market comparable method was not necessarily the most accurate. The Hamburg Shipbrokers Association (VHSS) even came up with their own suggested methodology to vessel values, the so-called Hamburg Rules, effectively a modified version of the income approach method. As the shipping markets kept improving and there was more activity with sale and purchase of vessels, vessel valuation methodology took the back seat in the world of shipping. Freight rates were improving between 2010 and late 2014, institutional investors were spending plentifully on new tonnage – increasing the volume and value of transactions, and lenders were hesitantly testing the waters of shipping again. And, then, 2015 came for the dry bulk market, that saw the Baltic Dry Index (BDI) to lose most of its value and set repeatedly all-time lows in early 2016; the index went from 1,000 to below 300 in about fifteen months, with negative cash flows for all dry bulk segments during this time. In such a miserable market, dry bulk prices have almost halved in the same period, with almost 30% of the decline coming in the winter of 2015 alone; indeed, 30% decline in asset prices in just three months. The fall has been so bad and unexpected that, in line of business, we are aware of several shipping ‘loans’ and other ‘debt products’ in shipping that went underwater in terms of loan-to-value in just three months from origination. Many of these projects also barely allow for interest and principal payments, so early into their terms. For shipping banks looking to exit the industry and disposing of their shipping loans, whether performing or not, the decline in asset prices of the last few months is a headache they least expected to have at this conjuncture. 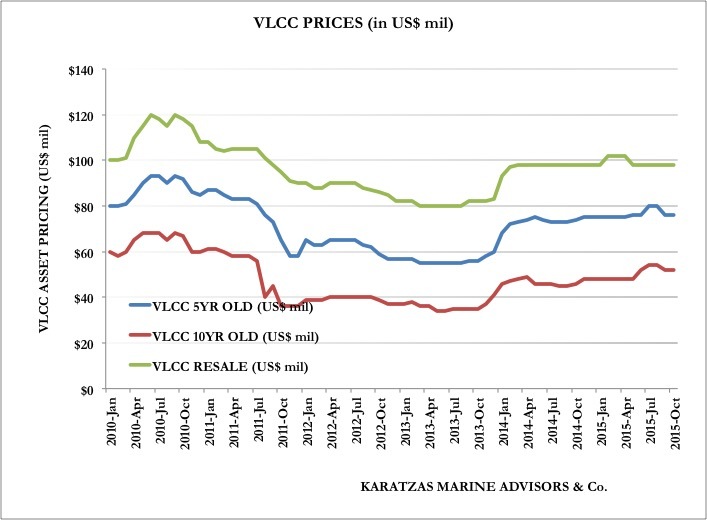 Declining asset prices make the collateral for performing loans less valuable; for non-performing loans under consideration for sale or restructuring or seeking additional capital, there is a limited option set now that vessels’ value have dropped so low. In the declining market, the volume of sale and purchase transactions has dropped too, allowing for few data points for comparison purposes. Again, arguments can be heard on whether the sale & purchase market is efficient as several of the sales are by parties that really have no other option but to sell; and, buyers – that is cash buyers in this market, are only looking for vessels to be bought below market, as there is little competition to keep prices at present (distressed) levels. The sale & purchase market, at least for dry bulk, is dysfunctional at present. Valuation methodology, again, after several years at the back-burner, has become pertinent again. Values are too low and they have been causing extended pain for shipowners and lenders, with wide spillover effects in many parts of the business. There have been complains that values are artificially low since the market is dislocated, and valuation methodology may need to shift toward future cash-flows and expectations or even suspended, and more tolerance and patience should be considered in this market. It’s hard valuing a dry bulk market when cash flows are negative and an acquisition today would imply a negative cost of carry for some time. Market prices have to reflect that. But again, we are at a market point where buyers and sellers are stretched, beyond what a statistician would call ‘three sigma rule’ – three standard deviations from the mean or 98% of the market. Vessel values and prices have diverged so meaningfully, that it can be an example of Warren Buffett’s dictum of not confusing value with price; ‘value is what you get, price is what you pay’. And, it’s true, vessel values are not as crucial or as important as in the past; when the borrower cannot service the mortgage since cash-flows are negative, there are higher priorities on the table than the value of the asset; at least for now. However, keeping an eye on the future and hope for recovering shipping loans, vessel values at present do not offer much to hope for. Dry bulk vessel against the Manhattan skyline: getting no respect from the financial markets. Image credit: Karatzas Maritime Images. Posted on October 23, 2015 by Karatzas Marine Advisors & Co. The tanker market has been enjoying a robust freight environment reminiscent of the days of the great bull market in 2008, with rates for the flagship sector of VLCCs topping $100,000 per diem. 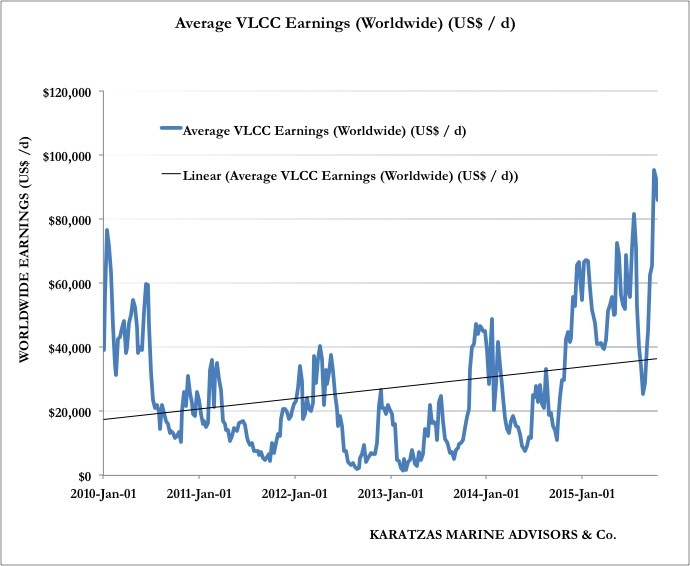 The strength of the market is well-deserved, and one is content to see smiling tanker owners after the brutal 2011-2014 bear market when rates barely topped $20,000 pd for the VLCCs, as per Exhibit A.
EXHIBIT A: Average VLCC Earnings Worldwide; Karatzas Marine Advisors & Co.
It’s well known that skyrocketing freight rates always pull up with them asset prices, with some small time lapse of one-two months. Volatility in freight rates leads to ‘asset play’, the favorable way of shipowners hitting the jackpot. It’s well known that shipping asset prices can double, treble or quadruple in a matter of a few short years, allowing for enormous paychecks. Actually, this is the reason that many shipowners and investors and private equity funds have been attracted to this industry in the first place. The present pricing environment for tanker vessels has been a major head-scratcher. While freight rates have more than doubled in the last eighteen months in the VLCC market (Exhibit B), tanker prices have barely moved higher by 10%, or 20% depending on asset class and vessel age profile. The difference in the order of magnitude is just too big to be attributed to ‘statistical error’ or just to a market anomaly or temporary dislocation. Trying to find out the reason behind the disconnect is not a pure academic inquiry; it has commercial value in the short term, to say the least, and it may imply that the market has changed and new expectations / leads / drivers are prevailing now; and the sooner an investor deciphers the meaning of vessel values in the new environment, the sooner one can dodge the troubles of a changing market or the sooner one can position themselves better for the paradigm shift. The years between 2011 and 2014 have been awfully bad for tanker owners as well, and many of these shipowners have burned more cash than they cared to; thus, now after three years of major losses, the focus has been on building up some cash, bring their loans current with the banks, and otherwise setting their financial house in order. Since the years 2011-2014 scared some of the tanker owners to bankruptcy, getting aggressive at this phase of the cycle is a bit too premature for many of them. And, accordingly, chasing tankers to buy and bidding up prices has not been the case; it’s understandable. Looking a bit deeper into the market, one can discern the lack of the strong buying interest from ‘smart money’, shipowners and market players who have the reputation for sensing and timing the market over time, and placing the right ‘bets’. Most reference name Greek shipowners have been conspicuously absent from the sale & purchase market, and similarly for names like Fredriksen, Zodiac, etc It seems that the present rally has failed to impress this demanding audience to open up their wallets (some of these owners have bought tankers, true, but on a much smaller scale than their financial appetite would afford to saturate). Most prominent recent transactions in the tanker market have been with OPM (other people’s money) by publicly listed companies like Euronav and Gener8, companies that their stock price trades below their NAV (their net value of their fleet) in the hopes that they will be able to pull the asset market higher and possibly benefit their own shares. Posted on February 3, 2014 by Karatzas Marine Advisors & Co. Valuing vessels, similarly to valuing a house or commercial real estate or any other piece of property or equipment or even a business, it can be both an art and a science. The reasons for obtaining vessel valuations can vary, and the parameters for placing a ‘value’ accurately can be both objective and subjective. Vessel values have mostly to do with the ‘price’ of the asset and rarely with the ‘value’ thereof; but again, a market transaction takes place when a buyer and a seller agree on the price but they disagree on the value of the underlying subject matter. Our firm, Karatzas Marine Advisors & Co., has been involved profoundly with vessel valuations to the extent of being considered experts on the subject of vessel valuation; we have published expensively on the subject, as well, and we have provided valuations considering every methodology available and variant thereof, including incorporating financial analysis and modeling and physical inspection of the vessel. An article on the principal methodology of vessel valuations (market comparable approach, income approach method and replacement cost method) is posted herewith. The article was posted originally in the Tanker Operator magazine in December 2009. The article has been widely quoted in the shipping and banking industries, and also has been mentioned in a case study about vessel valuations prepared by the Harvard Business School. Please click here to access the article!